EUROPE: Transmission operator Tennet has unveiled a hugely ambitious vision for an interconnected North Sea with the proposal of a 'hub-and-spoke' transmission solution. Tennet's vision looks to connect the North Sea countries and their offshore projects. Tennet CEO Mel Kroon said each state — Germany, Denmark, the Netherlands, Belgium, the UK and Norway — would need to collaborate more closely and be less precious of their power. Dutch state-owned Tennet is transmission operator in the Netherlands and parts of Germany. "It will be very important for the six European North Sea countries to be willing, in due course, to make their targets independent of national borders, which means agreeing that the electrons generated offshore must not necessarily be transmitted to their own country." 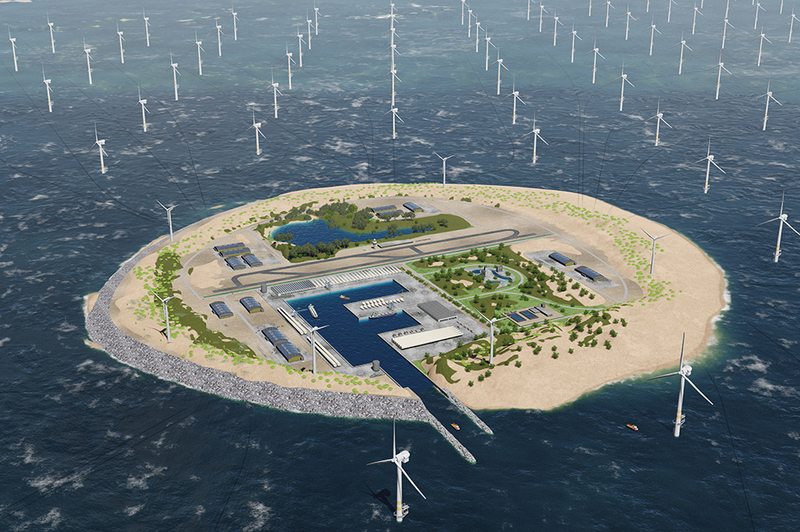 The artificial island "hub" would be surrounded by offshore projects in the North Sea and connected together via the "spokes" of project export cables. Tennet said an island would allow for shorter connections between projects and an AC-to-DC substation. Tennet argues the shorter distance would allow developers to use cheaper AC cabling. The island idea is a response to offshore projects being sited further away from shore, as the suitable, closer-to-shore sites are being used up. EWEA is predicting a further 600GW of wind energy will be needed in the future, Tennet said, most of which will be provided by offshore projects. From the island, the electricity can then be transmitted to wherever it is needed most through DC cables — similar to transnational interconnectors, allowing the island also to act as a power trading route between countries. Although DC technology is more expensive, this approach would need fewer DC cables — one for each country, with each nation benefitting from several offshore projects, Tennet argues. The island would need to be located in an area of shallow water with strong, constant winds in a central location, leading Tennet to suggest the Dogger Bank area in the UK as a prime location for the island. 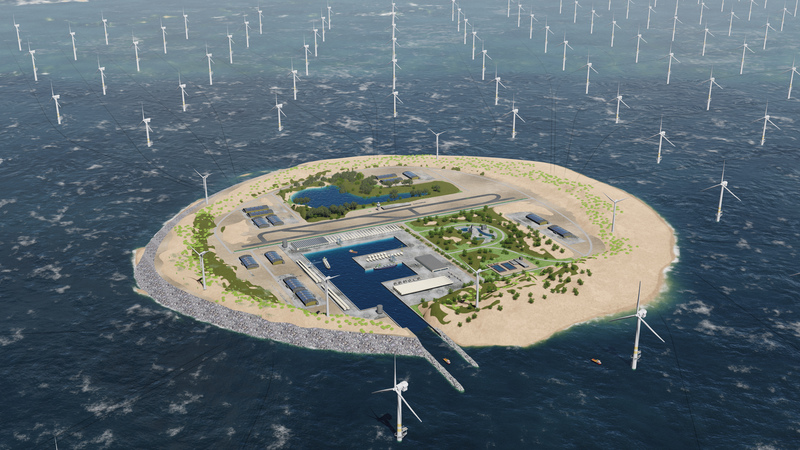 For the island, Tennet suggests a modular approach. Each module would cover 6 square kilometres, giving enough space to connect 30GW of wind capacity. The island can then been expanded using further 6-square-kilometre modules. The island would also accommodate a permanent base for installation vessels and their workers and associated infrastructure, storage, a landing strip for crew transfers, permanent residences and maintenance facilities. "In short, an island in the middle of the North Sea offers everything necessary to make offshore wind energy a success," Tennet said. Tennet said it would enter discussion with the EU and member states "to see whether the required European cooperation can be set up". The concept is not imminent however. The firm said it expects the closer-to-shore areas to be developed first. However, it proposes a link between the Dutch 5-6GW Ijmuiden Ver zone and the UK's East Anglia Zone, including an island in the link to be built between 2025-2030. An island on Dogger Bank could then follow between 2030-2050. Tennet's vision follows a political declaration this week between nine EU member states — bar the UK — to collaborate more closely on developing the offshore wind industry. Question of the week: Is a European supergrid possible?